Kae sa lak and kae cha loo are traditional Thai sculptural processes used in carving for decorative purposes. Kanda applies it to ceramics, each one with floral shapes incised into the clay before the piece is fired. 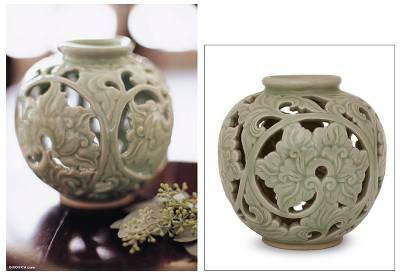 This decorative vase is then glazed in the traditional celadon method, giving it a lightly crackled antique appearance. The beautiful design recalls lush foliage in an alluring vine-like formation. 15 cm H x 14 cm Diam. 6" H x 5.5" Diam. You can find celadon ceramic vase 'Ivy' by Kanda in vases categories such as Celadon Vases, Leaf and Tree Vases, East meets West Vases and Ceramic Vases. Enjoy exploring these sections for other Novica treasures.